BlytheLife.com » Interview with Dolly Cupcake & Giveaway! 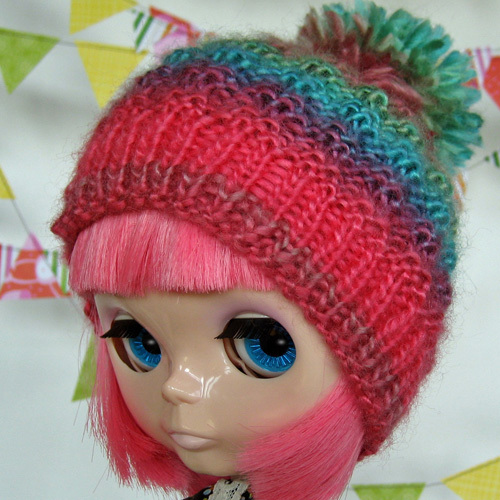 I love getting to know people who design and sell things for Blythe. Kirin of Dolly Cupcake contacted me about doing an interview and a giveaway and I couldn’t have been more thrilled! If you are interested in getting featured, let me know! Hello Kirin! Tell us a little bit about yourself! Hi Michelle and BlytheLife! I am Jill of all trades. I’m equally happy working in the garage building things with my long-time boyfriend, Victor, as I am sewing dainty things for Blythe. I am a tattoo artist by trade. I have been sewing, in one form or another, since I was just a little thing. One of my fondest early memories are of embroidering with my maternal grandmother. My paternal grandmother was an incredible seamstress. She made a lot of my most-special dresses and I think that was one of the biggest sparks in my creativity. She let me use her sewing machine for the first time when I was about seven to make a Barbie dress out of leftover scraps from a dress she had made for me. Even then I knew that sewing would be a big part of my life. My mom got me my first real sewing machine when I was fourteen at a yard sale. That machine was almost life changing. From that point on, I was unstoppable. I could create anything with fabric that I could dream up. I’d been sewing my own clothes for several years before I got my first Blythe. Once she came into my life I started creating for her too. I first learned about Blythe from a brief magazine article about Gina Garan’s book “This Is Blythe”. I was transfixed by the accompanying images from her book of this wonderful big-headed, big-eyed doll. I loved that she had used this strange and beautiful doll as her muse. In the following years, I would occasionally check eBay for dolls and thought that they were crazy expensive. The stock ones were at least a hundred dollars and seemed like too much for a plastic dolly for me. Once I started seeing more of the custom girls, I knew that I had to have one to make my own. Who’s in your Blythe family? I have a very modest collection of Blythes. 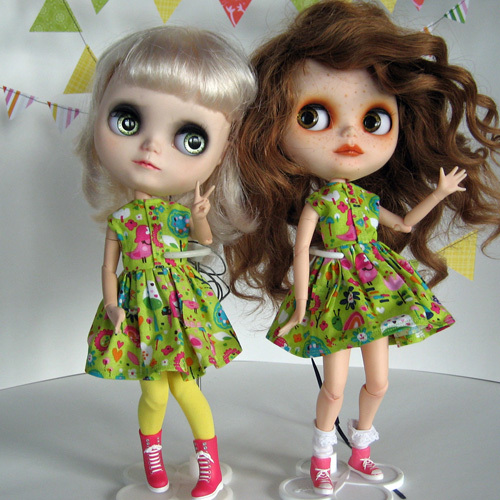 I didn’t get my first Blythe until 2011. I actually got two at the same time. A set of Simply Vanilla and Simple Chocolate. I immediately opened both of them from their shippers and decided that Vanilla was the first that I would customize. I still have that Simply Chocolate in her box, stored away for a future project. I customized the Simply Vanilla as a moody, pouty blonde. She is a bit of a puzzle to me. It took some time but I’ve decided her name is Gracie. Camilla was my first purposeful custom. I created her with a vision of her being a kind forest girl, a friend to animals, and connected to nature. Her original name was Simply Ashlette. Lucianne, is my the custom girl born from a Nicky Lad. She is a plucky little thing who does what she wants. What made you decide to start sewing for Blythe? The first, and most obvious one for me, was a lack of clothing. My Simply Vanilla, my first Blythe, had stock clothing that was contrary to her customized persona. I simply had to make her some new clothes. I love creating tiny, cute things. So sewing for Blythe is right up my alley! What was the first thing that you created for Blythe? I first thing I created was an all black ensemble for Gracie that stained her Azone Pure Neemo body so badly I wanted to give up. But I got another body and started sewing for her again and finally learned my lesson about pre-washing fabric! The next ensemble was a satin and lace affair that suited her much better. Once I figured out a basic pattern for Blythe dresses, I was off and running! My favorite thing about creating for Blythe is the limitless possibilities. Blythe can get away with wearing some outfits that would be outlandish in the real world and she looks so cute doing it! Stained bodies are no fun! 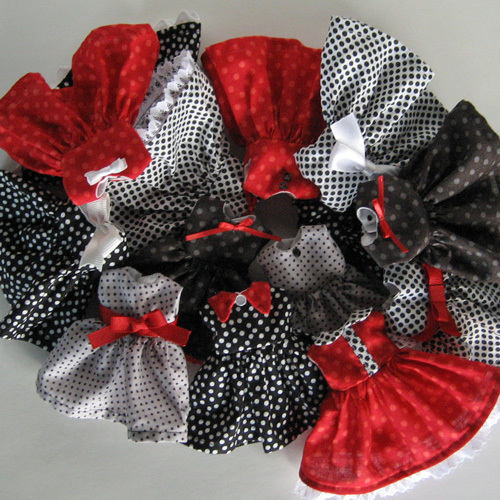 What has been the hardest thing about sewing for dolls as opposed to sewing for yourself? The hardest thing about sewing for dolls is the size! 🙂 Full-sized garments have a seam allowance that’s typically around 1/2”. The seam allowance for dolly clothing is a tiny fraction of that. Thank goodness I have good eyesight! Sourcing tiny buttons and snaps as well as appropriately scaled fabrics has been a little bit of a challenge as well, but that just means that I get to spend more time at the fabric store! 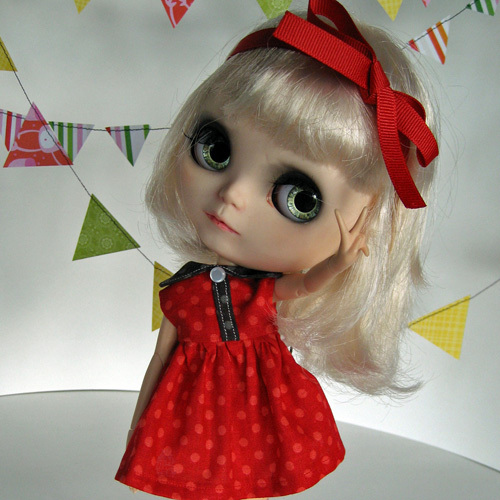 What would you say is your best sewing tip for anyone who’s interested in sewing for Blythe? I think my best tip for sewing for Blythe would be to take your time. Precision counts when working on such a small scale. But also to not be too hard on yourself. Sewing on a tiny scale will be challenging and your first pieces might not be perfect, but they get better and better with practice, so don’t give up! What are your must-have tools for creating fashions for dolls? My must have tools are cute fabrics, great light, and sharp scissors. I also like to set aside a lot of time to just play around with the fabrics and trims to see what I can come up with. Where did the name “Dolly Cupcake” come from? I was trying to come up with the most over-the-top, fun and silly name that I could come up with for my Etsy shop. I think it really sums up my design aesthetic for Blythe. It’s just cute and girly! How much of what you make ends up in your own dolls’ wardrobe? Honestly, not much of what I make for Dolly Cupcake ends up staying with me. My girls get to wear the dresses for the photoshoot and maybe for a day or so after, then the clothes get packaged up. Each girl has a small wardrobe of her own that reflects her “personality”. I hope to expand their clothing options soon but in reality what they really need is shoes. Poor things! Thank you so much for doing this interview with me, Kirin! What advice do you wish someone had given to you when you were new to Blythe? You can find Dolly Cupcake and those beautiful dresses over on Etsy! If you want to save 10% on your purchase at Dolly Cupcake, use the coupon code BLYTHELIFELOVE from now until September 14, 2015. Kirin has generously decided to giveaway one Dolly Cupcake dress to one lucky reader here on BlytheLife! The winner will get to choose what colour they’d like their dress to be in, how awesome! The giveaway runs until Saturday August 22nd 2015 at 11:59pm Pacific. The draw will be held on Sunday August 23rd 2015 and the winner will be announced on BlytheLife.com. Remember to use a valid email address for all comments. If you win, your email will be forwarded to Alli so she can get in contact with you regarding sending you the prize. I wish I was more adept at sewing! I keep accumulating fabric with the hopes that I’ll become better at it >_<. Thank you for the advice and the giveaway! staining is one of my dolly fears, so I really should be better about pre-washing. Please, keep sewing. No one is perfect the first time 🙂 And staining is the worst. I had no idea it could happen so quickly! Yikes! The dresses in the Dolly Cupcake store are very cute, I particularly liked the “Pretty Kitty” dress for Blythe. i’d love to win one of your beautiful dresses.. I’m very new to sewing and at the moment only have a few things of fabric have been mostly using old clothes. These dresses are just the cutest! I’ve managed to make a couple of simple skirts for my blythes so farand a little cotton top that’s not too bad. Lots more practice needed for such a tiny scale. Absolutely. It took me 5 attempts to make a top. I gave up on using the original fabric and turned that in to a skirt as it was Liberty fabric and I didn’t want to waste anymore. What a great interview! Loved looking through the cute dresses of her shop, and fun colours ? It’s difficult to pick just one favourite but I luv the ‘Ice Cream Dream’ Dress, cute small scale fabric is just so hard to find, but this one is just perfect. loooooooove the Spotty Dotty Empire Dress! I love all the dresses on your Etsy store! I had to favorite them all. Learn to sees someday but for now I’ll just enjoy purchasing the ones you’ve made. Oh and Polka Dots are my favorite!!! These dresses are very cute!My favorite is Grape escape, I love purple! Hey everyone, I just realized that my annual vacation happened to fall in the middle of the month that the 10% off coupon code is active. Oops! Sometimes I can be a bit of a space cadet! Received the dress today! It’s so beautiful. The quality is really really amazing. Thank you Dolly Cupcake and thank you Blythe Life!